This project began with a goal — run an Intel Core i7 860 at 4GHz consistently in a room with ambient temperatures of thirty degrees centigrade (30°C), and without excessive noise. Among the air-cooled heatsinks, the Prolimatech Megahalems Rev. B seemed to be the best choice at the time. The Megahalems Rev. B also comes with clips for two 120×25 mm fans, and clips for 120×38 mm fans are available, from other retailers. The Megahalems does not come with its own fans. This avoids wasting money on fans that may not meet the user’s needs, but it does raise the question, “What fans do I use?” I have collected a number of fans from a variety of places; they run from fancy to plain, expensive to dirt cheap, noisy to barely audible. 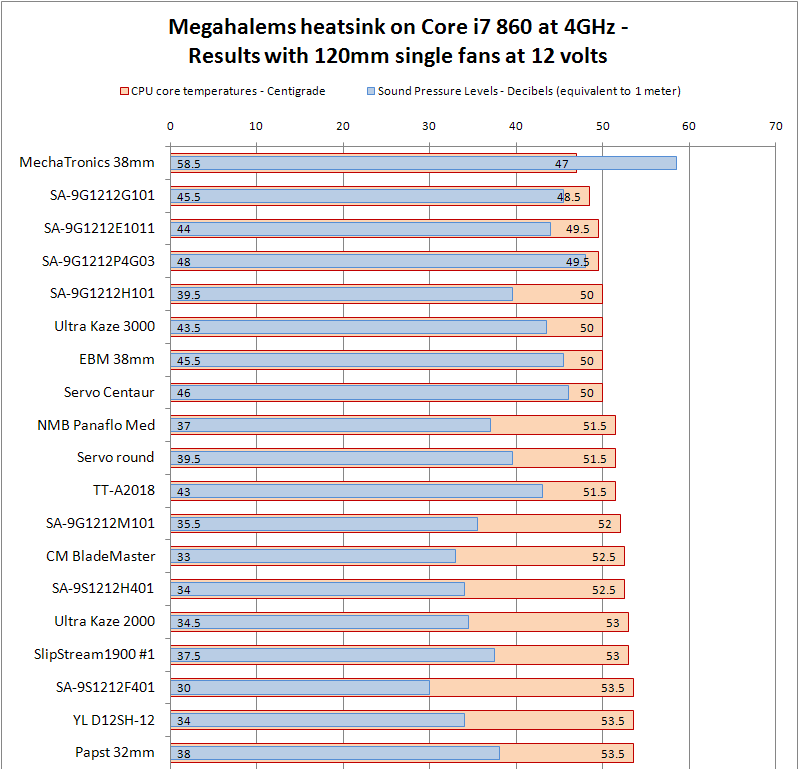 I tested all of these on the Megahalems heatsink. After a number of OCCT test runs, the system comes to equilibrium after about 35 minutes, and no further information was gained beyond 40 minutes. After that, CPU temperature changes reflected changes in the ambient temperature. So, the fan runs were 40 minutes each. CPU temperatures were based on the temperature signal sent by the CPU itself and interpreted by OCCT (it does not correspond with the actual temperature, but it is close enough for our purposes). Because the CPU reports the temperature in one degree Celsius (1 °C) increments, it was unable to report a temperature between those increments. However, a common pattern in temperature traces was a rapid alternation between a temperature and a temperature one degree higher. When a temperature reading fluctuated between one level and another, it was recorded as the lower temperature plus 0.5°C. Ambient temperatures were taken with a digital thermometer and reported to the nearest half a degree Celsius (0.5 °C). These were subtracted from the CPU temps to give temperature over ambient. This allows for results made at different times with different ambient temperatures to be compared. The more powerful the fan, the lower the temperature over ambient. Various specifications of fan output such as RPM, Static Pressure and CFM are merely suggestive. The temperature over ambient measurement is the final result. Sound pressure is measured in decibels, abbreviated as dB. The standard weighting is type A, abbreviated dBA. The SPL meter reports sound pressure levels (SPL) in tenths of a decibel. However, the meter specifications say it is accurate to 0.5 decibel above 30 dBA, so in the tables the SPL values were reported in 0.5 dB increments. When there is no extraneous noise, the basement where the fans were tested has a SPL of under 10 dBA, so background noise did not interfere with SPL measurements. The SPL measurements were made at 10 cm and converted to the standard 1 meter equivalent by subtracting 20 dB. Because a fan is loudest at its face, the reported SPL is 10 cm from the fan intake face. Note that your setup will have its own acoustics, so the noise at 10 cm may not drop off as rapidly as theory says; but these measurements are designed to allow us to compare fans, so they were converted to the standard measure: one meter (1 m). The thermal interface material chosen was one of the top performers in a recent 80-way TIM review. After trying several TIM, I settled on this one because I get the most consistent results with it. After the heatsink was mounted, the system was not disturbed at all for the length of the testing. Because even a fast-setting TIM like GC3 Extreme gains in performance over the first few days of its placement, formal fan testing did not begin until the fourth day. The entire set of tests was done over a 19 day span in April 2010. Following the testing, the heatsink was dismounted and the TIM pattern examined. The center of the CPU heat spreader showed near-exclusion of the TIM, with an even pattern of TIM surrounding the center. 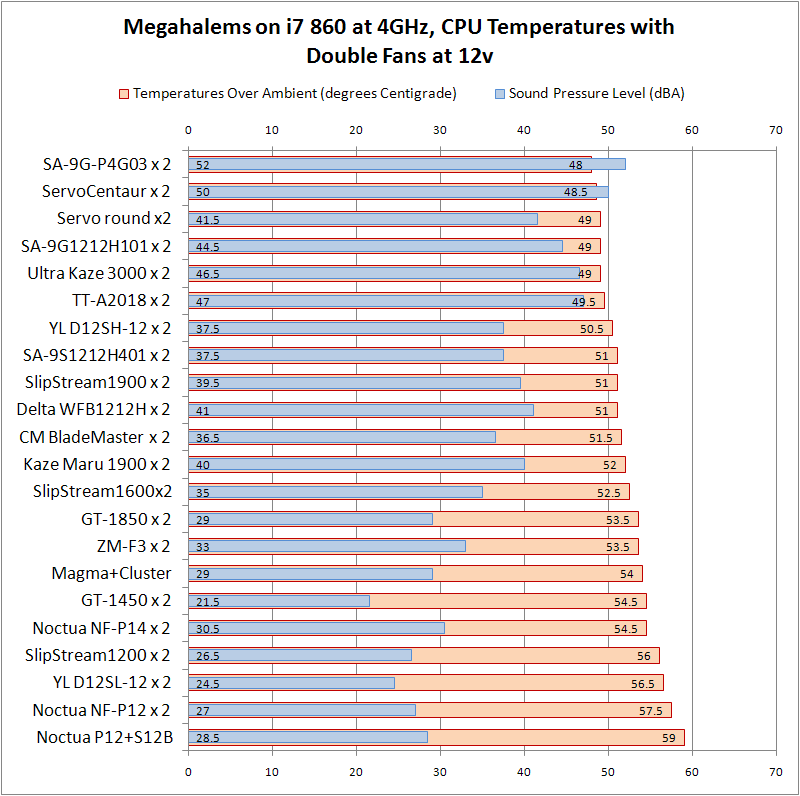 The following charts show the CPU temperatures of the hottest core at the end of 40 minutes, for each fan or set of fans. Each chart starts with the highest performing fans, and ends with fans that allowed the CPU core temp to reach 80°C – the fans that failed my criteria. To figure out what your own temperatures might be if you ran the same system of components, add the Temp Over Ambient to your own ambient temperature. That will give you some notion of what to expect. These charts are here to show the relative cooling performance and noise between each fan. Remember, the goal is to have a CPU core temp no higher than 80 °C with an ambient of 30 °C. In other words, I need a temp over ambient of 50 °C or less. Very few fans were that good. Note: Three separate images make up this chart. Nine of the top ten fans in cooling performance were 120×38 mm fans. These fans have excellent airflow, and tend to have higher static pressure than 120×25 mm fans. But, you pay for this performance with more noise. 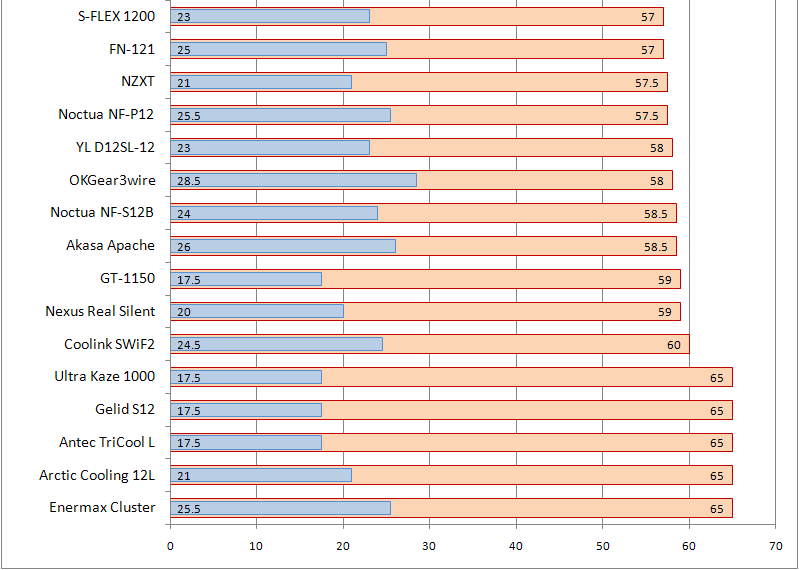 Of these fans, the San Ace 9G1212H101/9G1212H1011 is the fan with best cooling and least noise. But at over $18 per fan, it is fairly expensive. The Scythe Ultra Kaze performed as well, but was somewhat louder; it sounds louder than the SPL measurement. The main advantage is cost: you can buy one in the US for under $9. But it is a sleeve bearing fan. You must lubricate the bearing periodically to keep it running well. The Servo Centaur and Servo Round are excess inventory fans available for less than $6. They are fairly noisy, but high quality ball bearing fans. The NMB “Panaflo” Medium “hydro wave bearing” fan is widely available, with prices starting under $13. Based on the performance of the Medium, you should expect a Panaflo High to cool about as well as a San Ace, but 5 decibels louder. All of these fans make a clicking sound when they are undervolted – run at less than 12 volts. But the San Ace and NMB Panaflo fans have much quieter clicking; you may not even hear them click. Probably the best balance of cooling power and noise in a single 120×25 mm fan is the Cooler Master Blade Master. Widely available, the lowest price I have seen is $13 shipped. Following closely behind, though a bit noisier, is the Yate Loon D12SH-12 fan. There are reviewers who swear by this fan, and it can be found for $3.70 apiece, or $3.33 each for three or more. Another 120×25 mm fan that performs well is the 1900 rpm Scythe Slip Stream, available for $6. All three of these are sleeve bearing fans. They also click very quietly when undervolted. The Gentle Typhoons and the San Ace Silent series – 9S1212H401, 9S1212F401 and 9S1212L401 – have no clicking when undervolted. These are all ball bearing fans. The Gentle Typhoons are available for under $13, but the San Ace Silents are over $22 apiece, or over 23 English pounds in the UK. The bargain ball bearing fan is the Rosewill RFX-120. It comes bundled with a slot type fan controller, and seems not to click when undervolted. Finally, the Cooler Master R4-L2R-20AC-GP and the Zalman ZM-F3 are available for under $10, sometimes significantly less. Both are pretty well-performing sleeve bearing fans. 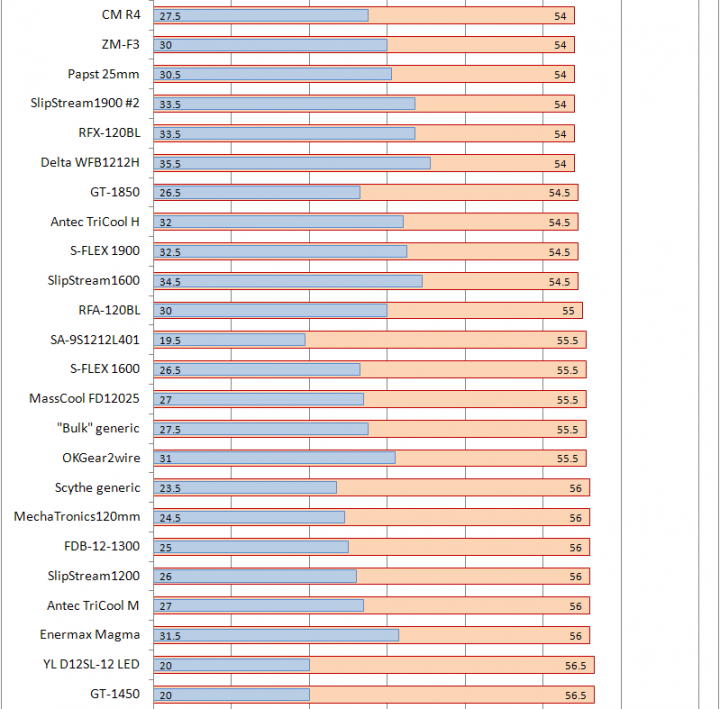 The rest of the fans – including the 140 mm fans – will make nice case fans. The Sound Pressure Level readings and their cooling performances will give you some notion of how well these fans will work as case fans. I tested some fans in pairs. With the high performance fans, you get an extra degree of cooling for a lot more noise. 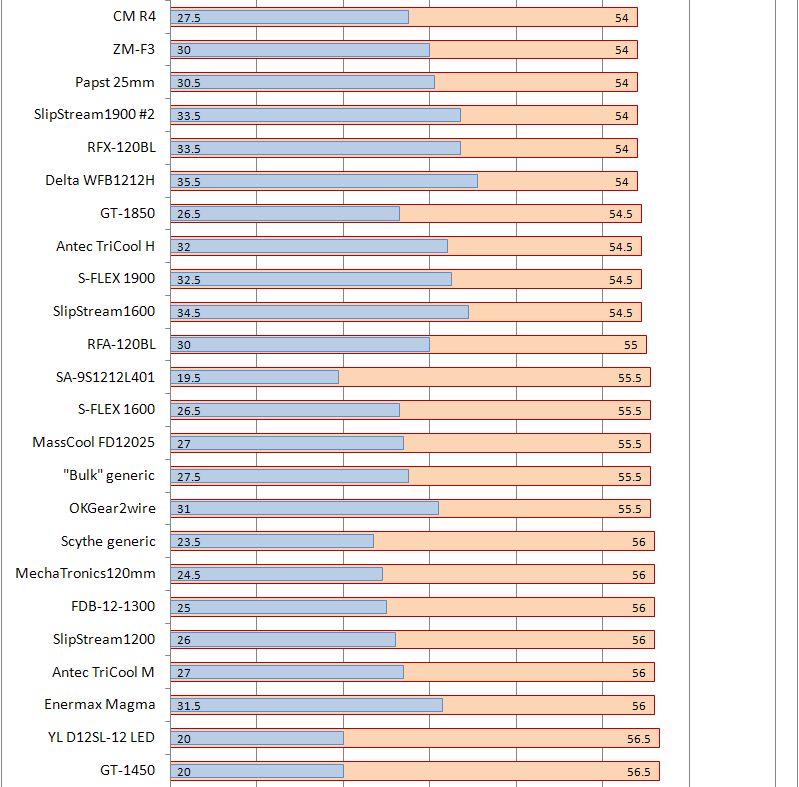 With the better 120×25 mm fans, though, the results were more interesting. Those YL D12SH-12’s really shine here. The CM R4’s and Blade Masters look nice, as do the pairs of Slip Stream fans. By the way – the 1600 RPM and 1200 RPM Slip Streams sound a lot quieter than their SPL measurements. I think the SPL meter picks up the white noise that our ears just ignore. So, what’s the best fan for your Megahalems? The San Ace 9G1212H101/9G1212H1011 is the fan that meets the 50 °C temperature over ambient criterion with the least noise. For a pair of fans, the Yate Loon D12SH-12 comes closest with a temp over ambient of 50.5 °C without being too loud, but in general two fans make a lot more noise for only a little more cooling. It is clear that we must accept a trade-off between fan cooling power and fan noise. As usual with overclocking, there are no simple decisions. I can tell a ton of effort was put into this. Great job! I'll be using this as a reference when buying fans in the future, thanks! This is a useful resource for air and water coolers alike. Thanks. This was incredibly helpful. I mean it. Thank you so much. I just ordered 2 R4-L2R-20AC-GP's for 7 dollars each. Never would have been able to make such an educated decision without this post. Seriously, thanks! Thank you very much. This test basically made my decision about fans, I'll be going with 2 Panaflo HS. What? No Deltas in that mix? The chart is in three pieces. The Rosewill RFX-120 is in the lower third. There are also two 25mm Deltas there. This is a very interesting, ambitious roundup that's unfortunately very flawed in acoustic SPL measurements. 1) The Tenma 72-942 SLM used can only go down to 30 dB, so how did the author know the ambient in the room was 10 dBA? 2) Specs on this sound level meter that I found state accuracy to be ±1.4dB at 1KHz, 94dB; not the 0.5 dB claimed by the author. It may go up/down in 0.5 dB steps, but that is not its accuracy. 3) There's no mention of any calibration done on the meter, which means we don't know how closely the meter meets reference SPL standards. 4) The mic was placed 10cm or 4" away from the fan intake face, and the SPL reading converted to the standard 1 meter equivalent by subtracting 20 dB. How did the author come to this odd conversion formula? Never mind; these kinds of SPL conversions from "close mic" results rarely (if ever) work. 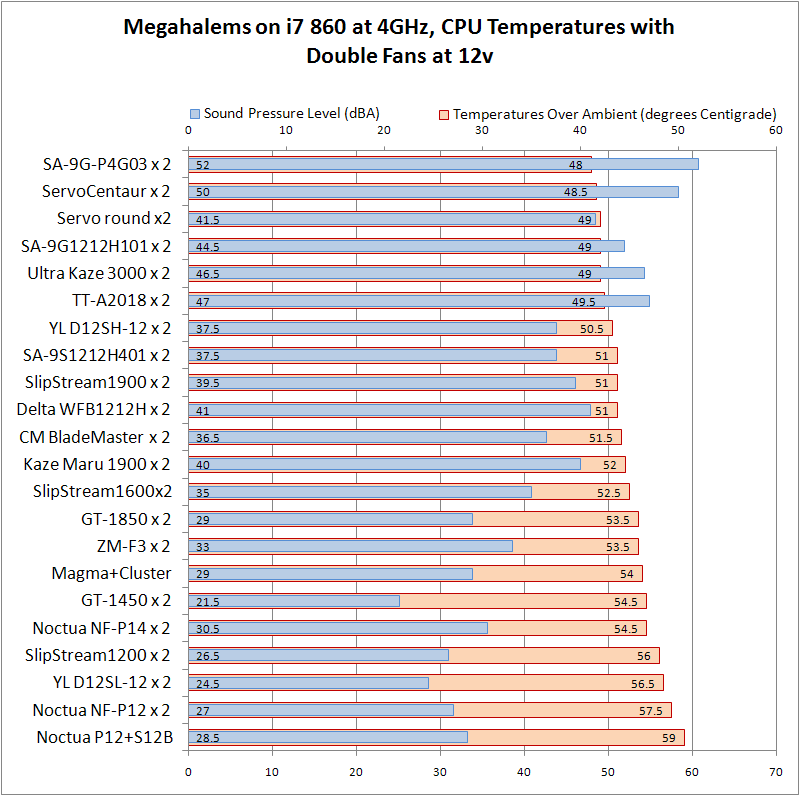 Examining the actual SPL reported in this review for fans I've also measured in the anechoic chamber, I can say that these results are all over the place. Mostly they appear to be too high, by up to 9 dBA compared to the anechoic chamber 1m SPL tests I've done on samples of some of the same fan models. 5) There's no mention of how many samples of each fan model were tested, so I presume just one -- which is really not good enough considering how much samples can vary acoustically, sometime due to subtle damage in shipping alone. I appreciate the enormous time and effort that must have gone into this test project, but the resulting data is of dubious value. The author's subjective comments are far more useful than the SPL results or any analysis based on SPL vs temperature. Obviously, the thermal results are worthwhile, possibly even invaluable... if you could assign accurate SPL values and subjective acoustic ratings to the fans. The published specs on the unit were changed sometime after it was purchased. It actually reads in 0.1 decibel increments. The meter reads down below 30 dBA, but I treat them as ever greater approximations the further they fall below 30 dB. Decibels are a semi-log scale. Multiplying a distance times ten is in theory equivalent to dropping the measured SPL by 20 dB. Of course, you never get that theoretical dropoff due to case acoustics. I would expect essentially any fan to sound louder working against resistance than in free air. See this pdf from Nidec as an example. In any case, the SPL readings from industrial fans were close to theiir published specs. As for fans sold to consumers, well . . . I don't trust the specs so I measured the fans. The point of posting the numbers is simply a way of comparing fans on a mount. These are relative values and cannot be compared with any other setup, just with each other. Hey, thanks for the article. I have a question, when you benched the 140 on the Prolima did you use the supplied fan clips?, was it easy to install them with said clips like with 120's or do you had to mod the clips or something?, because i bought that heatsink a while back and now i'm planning to use it and buy a Corsair AF140 to go with it but i'm not sure if it will fit with them clips and don't want to waste the money and end up having to buy another fan and putting the Corsair in my case, lol. So i'd appreciate if you could shed some light on this, thanks in advance! If your 140mm fans have 120mm standard screw-holes (105mm apart) the Megahalems fan clips work well. If you use fans with 140mm screw-holes you may have to use ziptie screws. But did you use those "ziptie screws" back in the day when you tested all those 140mm fans on the Megahalems or you installed them with the supplied fan clips just fine? that's what i want to know. Back in the day, all I had were Megahalems clips for 25mm and 38mm fans. The 140mm fans perforce had 120mm screw-holes. Were I to re-do it today I would use the 140mm fan clips for the Megahalems. But I have all those things. Luckily, the last time I looked the Mega is still for sale, which means the 140mm edge clips are still available. But if you can't get them, ziptie screws will work. In fact, I use them today. This pic shows my previous case but my current heatsink (an Armageddon) and two Noctua NF-A15 PWM's. Yeah can't get them clips where i live, and just realised how "ziptie screws" were called in my language. I certainly can get those and looked through the thread you pointed my way but still not quite sure on how to "close" them, do you use 2 of them for each screw hole one through each side?, that's the only thing i can think of. Also i can get them in 2.5x100mm, is that good or do i need bigger or smaller ones?. Thanks for all the help so far mate.